Chehalis (/ʃəˈheɪlɪs/ ( listen) shə-HAY-lis) is a city in Lewis County, Washington, United States. The population was 7,259 at the 2010 census. It is the county seat of Lewis County. Chehalis began as a settlement around a warehouse beside a railroad track in 1873, when the Northern Pacific Railroad built northward from Kalama to Tacoma, and ignored Claquato, then the county seat three miles to the west. After the Northern Pacific bypassed Claquato, the county seat was moved to Chehalis, leaving Claquato little more than a historical landmark. By 1874, a store was added to the warehouse, and several houses were constructed. The new town was first named Saundersville, for S.S. Saunders, on whose donation land claim it was founded. In 1879, the name was changed to Chehalis, named after the Chehalis people; Chehalis was a native term roughly meaning "shifting sands", denoting the muddy bottomland along the Chehalis River which had long vexed stagecoach travelers on the Washington arm of the Oregon Trail between Kalama and New Market (now Tumwater). Chehalis was incorporated on November 23, 1883. Logging soon began in the nearby forests. Lumber workers of Scandinavian, Anglo-Saxon, and Scots-Irish descent arrived and settled in the neighboring valleys. In 1940, the chief local industries were: dairying, poultry raising, fruit growing, milk condensing, fruit and vegetable packing, brick and tile manufacturing, coal mining, portable house manufacturing, and fern shipping. According to the U.S. Census Bureau, the city has a total area of 5.55 square miles (14.37 km2), of which, 5.53 square miles (14.32 km2) is land and 0.02 square miles (0.05 km2) is water. The city straddles Interstate 5 at a point almost exactly halfway between Seattle, Washington and Portland, Oregon. The historic downtown and most of the city's amenities lie on the east side of the freeway, nestled at the base of a small range of forested hills. On the west side of the freeway are parks, farms, and a few subdivisions developed in the hills to the west. A small airport is located immediately west of the freeway towards the northern end of the city. From numerous vantage points in the hills just west of town, one can see Mount Rainier, Mount Adams, and Mount St. Helens—weather permitting. Chehalis is a frequented stop by bicyclists while on the annual Seattle to Portland Bicycle Classic. The Chehalis River winds its way through the valley in which the city resides, and is there joined by a tributary, the Newaukum River. Both rivers are prone to flooding during periods of abnormally heavy or persistent rain, and the lowlands from the freeway westward are particularly susceptible to inundation. This region experiences warm (but not hot) and dry summers, with no average monthly temperatures above 71.6 °F. According to the Köppen Climate Classification system, Chehalis has a warm-summer Mediterranean climate, abbreviated "Csb" on climate maps. As of the census of 2010, there were 7,259 people, 2,868 households, and 1,655 families residing in the city. The population density was 1,312.7 inhabitants per square mile (506.8/km2). There were 3,131 housing units at an average density of 566.2 per square mile (218.6/km2). The racial makeup of the city was 87.0% White, 1.7% African American, 1.3% Native American, 1.3% Asian, 0.2% Pacific Islander, 5.7% from other races, and 2.8% from two or more races. Hispanic or Latino of any race were 11.6% of the population. There were 2,868 households of which 31.1% had children under the age of 18 living with them, 36.9% were married couples living together, 14.9% had a female householder with no husband present, 6.0% had a male householder with no wife present, and 42.3% were non-families. 35.3% of all households were made up of individuals and 16.8% had someone living alone who was 65 years of age or older. The average household size was 2.36 and the average family size was 3.02. The median age in the city was 33.5 years. 24.5% of residents were under the age of 18; 12.5% were between the ages of 18 and 24; 25.9% were from 25 to 44; 22.6% were from 45 to 64; and 14.4% were 65 years of age or older. The gender makeup of the city was 50.2% male and 49.8% female. As of the census of 2000, there were 7,057 people, 2,671 households, and 1,696 families residing in the city. The population density was 1,259.0 people per square mile (485.7/km²). There were 2,871 housing units at an average density of 512.2 per square mile (197.6/km²). The racial makeup of the city was 89.56% White, 1.35% African American, 1.46% Native American, 1.20% Asian, 0.24% Pacific Islander, 3.95% from other races, and 2.24% from two or more races. Hispanic or Latino of any race were 7.91% of the population. 18.4% were of German, 11.0% English, 11.0% American and 8.4% Irish ancestry. There were 2,671 households out of which 33.2% had children under the age of 18 living with them, 43.8% were married couples living together, 14.4% had a female householder with no husband present, and 36.5% were non-families. 30.4% of all households were made up of individuals and 15.1% had someone living alone who was 65 years of age or older. The average household size was 2.46 and the average family size was 3.06. In the city, the population was spread out with 29.2% under the age of 18, 11.4% from 18 to 24, 26.6% from 25 to 44, 18.9% from 45 to 64, and 14.0% who were 65 years of age or older. The median age was 32 years. For every 100 females, there were 102.0 males. For every 100 females age 18 and over, there were 94.0 males. The median income for a household in the city was $33,482, and the median income for a family was $41,387. Males had a median income of $32,289 versus $24,414 for females. The per capita income for the city was $15,944. About 16.0% of families and 19.8% of the population were below the poverty line, including 27.6% of those under age 18 and 8.9% of those age 65 or over. A map showing the Chehalis River, tributaries, and area railroads as forming the shape of a maple leaf. The city was known as "The Maple-Leaf City" due to the shape of the convergence of the Chehalis River, tributaries, and railroads. Chehalis was mentioned in Season 6 Episode 9 and Season 2 Episode 15 of Grey's Anatomy (New History). Chehalis is mentioned in the song One More Suicide by Marcy Playground off their premiere album. - Chehalis sister city with Inasa, Shizuoka in Japan, now merged into the city of Hamamatsu, which continues the relationship. Chehalis forms twin cities with adjacent Centralia. The Chehalis–Centralia Airport (IATA airport code CLS) is located within the Chehalis city bounds. Vernetta Smith Chehalis Timberland Library, this library was rebuilt in 2008 on the site of the original Chehalis Library and Chehalis city hall in 1910. The library is named in honor of the mother of former Chehalis resident, Orin Smith, the new library’s chief donor. Gail and Carolyn Shaw Aquatics Center, opened in 2014, The new aquatics center has slides, water toys, a beach-entry-style pool, new fencing, concrete walkways and benches. A redone version of the original 1959 pool. Lewis County Historical Museum, The Lewis County Historical Society and Museum celebrates the storied history of Lewis County, Washington. ^ "Chehalis". Geographic Names Information System. United States Geological Survey. ^ "US Gazetteer files 2010". United States Census Bureau. Archived from the original on January 24, 2012. Retrieved December 19, 2012. ^ "Population Estimates". United States Census Bureau. Retrieved October 22, 2018. ^ "The Evergreen State Souvenir by J.O. Hestwood, Chicago: W.B. Conkey Co., 1893, p.38". ^ "Outline of Hamamatsu – Sister Cities". Hamamatsu City. Archived from the original on 2016-01-01. Retrieved January 5, 2016. 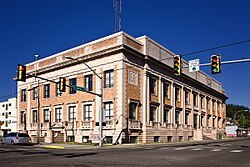 Wikimedia Commons has media related to Chehalis, Washington. This page was last edited on 29 March 2019, at 05:14 (UTC).